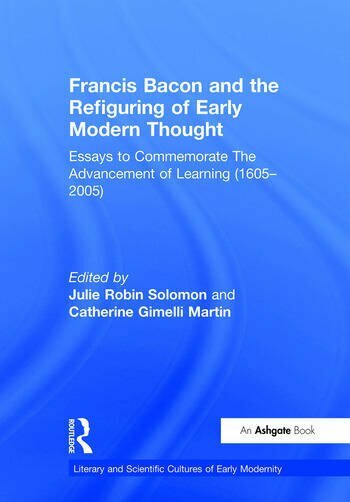 Commemorating the 400th anniversary of the publication of Francis Bacon's Advancement of Learning (1605), this collection examines Bacon's recasting of proto-scientific philosophies and practices into early modern discourses of knowledge. Like Bacon, all of the contributors to this volume confront an essential question: how to integrate intellectual traditions with emergent knowledges to forge new intellectual futures. The volume's main theme is Bacon's core interest in identifying and conceptualizing coherent intellectual disciplines, including the central question of whether Bacon succeeded in creating unified discourses about learning. Bacon's interests in natural philosophy, politics, ethics, law, medicine, religion, neoplatonic magic, technology and humanistic learning are here mirrored in the contributors' varied intellectual backgrounds and diverse approaches to Bacon's thought. Contents: Introduction, Julie Robin Solomon; Bacon, atomism, and imposture: the true and the useful in history, myth and theory, Reid Barbour; The new science and the via negativa: a mystical source for Baconian empiricism, Michael McCanles; The feminine birth of the mind: regendering the empirical subject in Bacon and his followers, Catherine Gimelli Martin; 'The very idea! ': Francis Bacon and E.O. Wilson on the rehabilitation of Eidos, John C. Briggs; Francis Bacon and the unity of knowledge: reason and revelation, Jerry Weinberger; The hidden life of matter: techniques for prolonging of life in the writings of Francis Bacon, Guido Giglioni; 'The purer foundations': Bacon and legal education, Daniel R. Coquillette; A society of Baconians? : the collective development of Bacon's method in the Royal Society of London, William T. Lynch; Francis Bacon, The Advancement of Learning and historical thought, Fritz Levy; 'Seated between the old world and the new': geopolitics, natural philosophy and proficient method, Timothy J. Reiss; Select bibliography; Index. Julie Robin Solomon is the Scholar in Residence at the Department of Literature, American University, Washington DC, USA. Catherine Gimelli Martin is the Professor of English at the University of Memphis, USA.